Spanish astronomer mathematician, and historian; born at Salamanca about 1450; died in Turkey after 1510. An astronomer of wide-spread reputation, he was appointed professor at the university of his native city, and later at that of Saragossa. After the Spanish exile, Zacuto settled at Lisbon, where he was soon appointed court astronomer and historiographer to John II. He retained his office under D. Manuel, and in this capacity he was consulted by the king regarding the practicability of the projected expedition of Vasco da Gama, which he approved and encouraged. The ships fitted out for the expedition were provided with Zacuto's newly perfected astrolabe, which was the first to be made of iron instead of wood. The great services rendered by Zacuto did not protect him, however, from the persecutions inaugurated by Manuel at the instigation of Ferdinand and Isabella; and he and his son Samuel were forced to seek safety in flight. After an eventful voyage in which he was twice taken prisoner, Zacuto reached Tunis, where he lived until the Spanish invasion, when he fled to Turkey, residing there for the remainder of his life. In 1504, during his sojourn at Tunis, he wrote a chronological history of the Jews from the Creation to 1500, making constant reference to Jewish literature, and entitling his book "Sefer ha-Yuḥasin." In this work Zacuto gives an account of the oral law as transmitted from Moses through the elders, prophets, sages, and the like, and also records the acts and monuments of the kings of Israel, as well as of some of the surrounding nations. In like manner space is given to the Babylonian captivity, the events which occurred during the period of the Second Temple, the characteristics of that period, the princes of the Captivity, and the rectors of the academies of Sura and Pumbedita. Although the author was far from discriminating as to his sources, and thus fell into many errors, his work is of great value to the student of Jewish literary history. 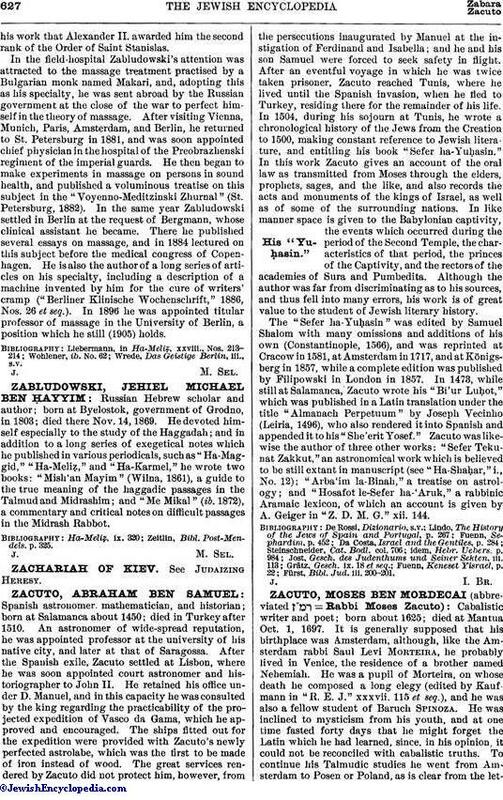 The "Sefer ha-Yuḥasin" was edited by Samuel Shalom with many omissions and additions of his own (Constantinople, 1566), and was reprinted at Cracow in 1581, at Amsterdam in 1717, and at Königsberg in 1857, while a complete edition was published by Filipowski in London in 1857. In 1473, while still at Salamanca, Zacuto wrote his "Bi'ur Luḥot," which was published in a Latin translation under the title "Almanach Perpetuum" by Joseph Vecinho (Leiria, 1496), who also rendered it into Spanish and appended it to his "She'erit Yosef." Zacuto was likewise the author of three other works: "Sefer Tekunat Zakkut," an astronomical work which is believed to be still extant in manuscript (see "Ha-Shaḥar," i., No. 12); "Arba'im la-Binah," a treatise on astrology; and "Hosafot le-Sefer ha-'Aruk," a rabbinic Aramaic lexicon, of which an account is given by A. Geiger in "Z. D. M. G." xii. 144. Fürst, Bibl. Jud. iii. 200-201.